Disclaimer: I have partnered with YMC and Bernardin and have received compensation for this post. All opinions are, as always, my own. This homemade salsa is nothing short of amazing. Really. I’m not just saying that. I’ve made this recipe 4 or 5 times now, so we’ve eaten a lot of this salsa, and it’s now rather disappointing when we run out of the homemade stuff and have to resort to the store-bought kind that we used to love. The homemade version is just so much better. This recipe does take some time though. I’m not going to tell you that if you start this recipe you will be finished in half an hour while simultaneously enjoying homemade canned salsa for six months. I won’t lie, that’s not gonna happen. BUT. It’s worth it. I promise. And it’s definitely not a difficult recipe – I guarantee that anyone can make it, it’s super easy – just takes a little time, that’s all. Mostly it’s peeling the tomatoes that takes a while. Again, not hard, but this makes a lot of salsa so you have to peel a lot of tomatoes. Don’t skip this step though, as you won’t be happy with the texture of the salsa if you leave the peels on. There are some step by step photos below the recipe for you – I’ve used two different methods for peeling tomatoes and both have their pros and cons. The traditional method of cutting an X in the bottom of the tomato and poaching it in boiling water for a minute before plunging it into an ice bath works really well – the skins always come off easily, but it is pretty hands on and takes a while to get through all the tomatoes. Easy to do though. The other option I’ve used is cutting the tomatoes in half and broiling them for about 15 minutes until the skins start to pucker and split. This is super easy, but I’ve found that you need to have the broiler on low as the tomatoes tend to blacken on top before the skins on the sides have started to come off when you broil on high. And then you need to wait for them to cool enough to handle them in order to remove the skins. So this is a little more hands off but probably takes just as long (maybe longer) – and I find that sometimes the skins don’t slip off quite as easily, although leaving the broiler on low and being patient does help! 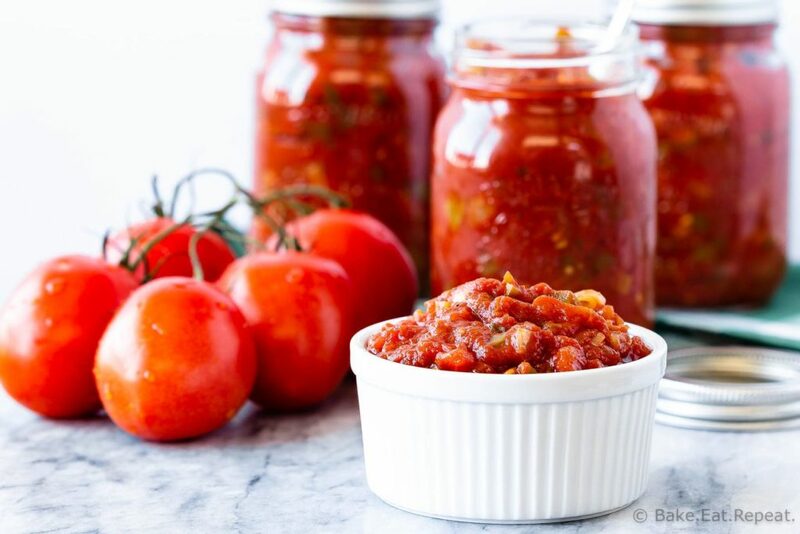 Besides the fantastic tasting salsa that you get from this recipe – I also love it because I can preserve it with a water bath canner and have fresh tasting, homemade salsa on the shelf for months. I love canning – although I only started it 6-8 years ago. It’s such a fun and easy way to preserve foods so we can enjoy them for months. I’ve made jam from the fruit trees in our yard for years – we just moved into a new house a couple years ago and I planted so many fruit trees and bushes, specifically so I could make lots and lots of homemade jam! 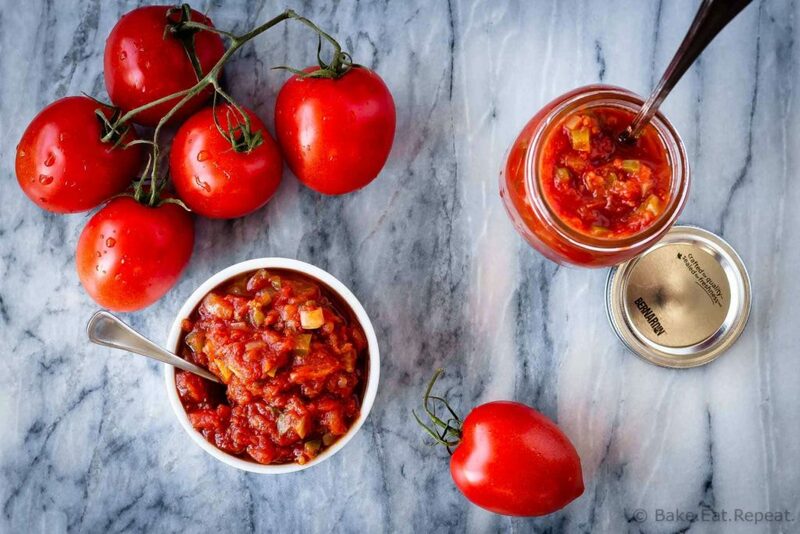 If canning seems too scary for you (it’s easy – don’t be scared!) 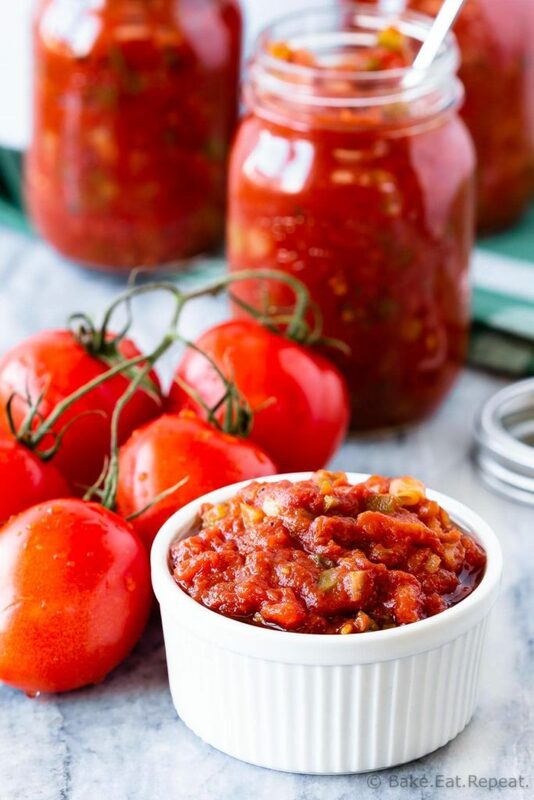 – I’ve also used mason jars to freeze this homemade salsa and they work very well for that. I’ve used the regular lids, but have some of these plastic lids too, and definitely prefer those for the freezer when I have some available. So, whether you love canning or not, you can still enjoy this homemade salsa. But I would highly recommend trying your hand at canning if you’re even remotely interested – you’ll probably fall in love with it and want to can all the things! I know I did! When removing the tomato skins – if you’re using the boiling/ice bath method, make sure to cut an X on the bottom of the tomato and cut out the stem end, and leave the tomatoes in the boiling water until the skins start to split – it usually takes about a minute. If you’re broiling them, place the rack in the middle of the oven and broil on low – it takes longer then if the rack is at the top on high heat, but the skins will separate much easier from the sides of the tomatoes without blackening too much. I always use Roma tomatoes for this recipe – if you’re using a different kind of tomato the weight will be different as the liquid amount in different types of tomatoes varies – I’ve included the approximate weight of fresh tomatoes needed in the notes of the recipe. Make sure you measure the tomatoes after they’ve been peeled, chopped and drained. 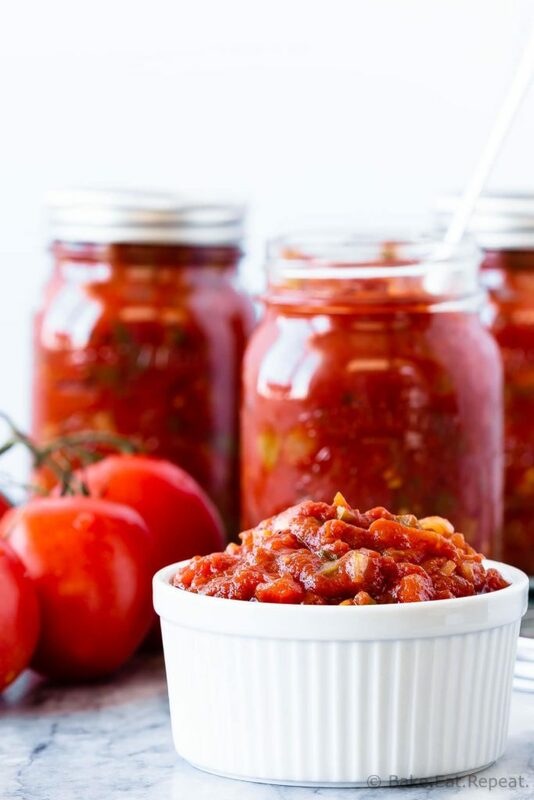 Don’t change up the ingredients in this recipe unless it’s indicated in the recipe that you can – canning safety is based on the specific pH of the recipe and if you alter the ingredients it will change the resulting pH, possibly making your salsa unsafe to can. If you want to change things up, I would suggest freezing it instead of canning it. If a jar doesn’t seal after processing, you can reheat that salsa and try processing it again with a new lid if you like, but I usually just freeze any jars that don’t seal as it doesn’t seem worth the effort to reheat and sterilize everything. You can make this salsa in half pint (250mL) jars instead if you like, but don’t use bigger, quart (litre) sized jars as this recipe hasn’t been tested with those and it may not be safe to can in them. This homemade salsa is so much better then anything you can buy at the store, and is easy to make. 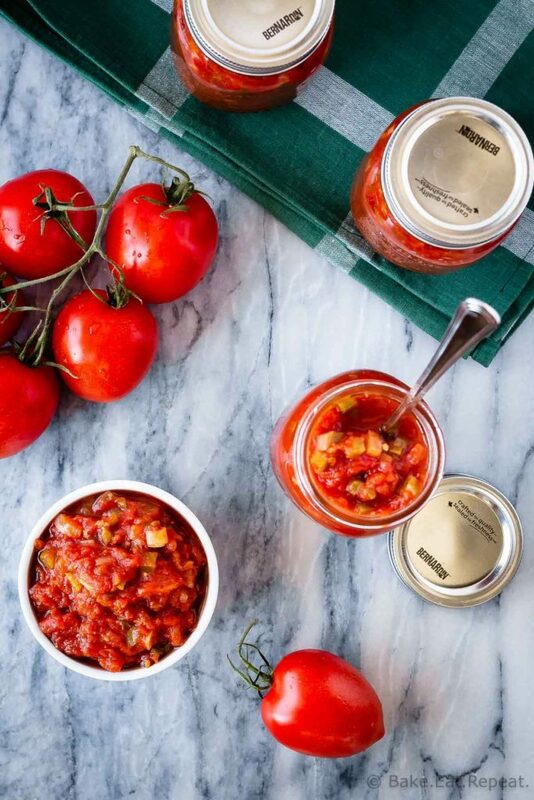 You can even can it at home with a water bath canner so you can enjoy fresh tasting, homemade salsa all year long! Remove the skins from the tomatoes. You can do this two ways - the first option is to slice the tomatoes in half and place them cut side down on a baking sheet. Broil on low with the rack in the middle of the oven for 12-15 minutes, or until the skins start to crack and blister. Let the tomatoes cool until you can handle them, then remove the skins, squeeze out some of the liquid, then chop the tomato flesh and place it in a large colander to drain. The other method is to cut the stem end of the tomato out, slice a shallow “X” in the other end, and drop the tomato into a large pot of boiling water for about a minute. When the skin has cracks in it, remove it with a slotted spoon and immediately place it in an ice water bath. Once it has cooled, the skin should slide right off. Squeeze some of the liquid out of the tomato, then chop the tomato flesh and place it in a large colander to drain. Give the chopped tomatoes a stir every now and then to help them drain. Once the tomatoes have drained, measure out the 8 cups needed for the recipe, and add them to a large pot. Add the onion, peppers, garlic, cumin, pepper, salt, cilantro, sugar, vinegar, tomato sauce and tomato paste. Stir everything to combine. Bring the mixture to a boil over medium high heat and boil for 10 minutes, stirring often. Fill hot, sterilized pint-size (500mL) jars to within a half inch of the top. Wipe the top of the jar with a clean cloth and add a hot lid (keep the lids in a pot of simmering water until you’re ready to put them on the jars) and a ring. Only twist the ring onto the jar until it is fingertip tight, don’t over tighten it. Process the jars in a water bath canner for 15 minutes (add 5 minutes if you live at 1,001-3,000 feet; add 10 minutes for 3,001-6,000 feet; add 15 minutes for 6,00-8,000 feet; add 20 minutes for 8,001-10,000 feet). Remove the jars carefully from the water bath canner, without tilting them, and let them cool, undisturbed, for 24 hours. Check the jar seals - if the lid has sealed correctly it will curve downward, and will not move when it is pressed. Any jars that haven’t sealed will need to be refrigerated and used within 2-3 weeks, or you can freeze them for future use. 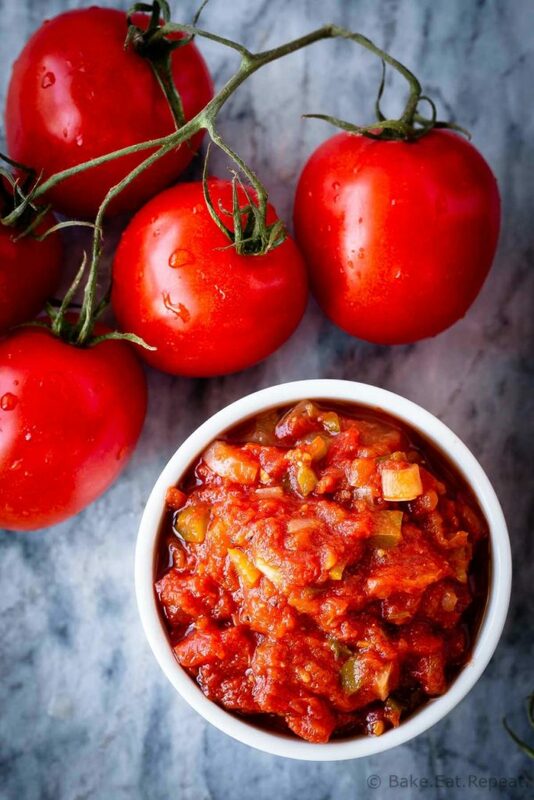 If you aren’t processing the jars, let them cool to room temperature, and then refrigerate the jars if you’re using the salsa in the next 2-3 weeks, or freeze it for up to 3 months. For the tomatoes - you need 8 cups of chopped and well drained, peeled tomatoes. The weight amount of fresh tomatoes that you need will vary depending on the liquid content of your tomatoes - for this batch I used 12.5lbs (5.75kg) of Roma tomatoes. If you’re using a different kind of tomato you will likely need more then that as Roma’s have less water in them then other varieties. Generally speaking, you’ll need 11-14 pounds of fresh tomatoes, and I tend to err on the side of too many so I don’t need to go get more tomatoes halfway through making salsa! After removing the skins, I find it easiest to squeeze as much liquid out as I can, then chop the remaining tomato flesh and put it in a large strainer over the sink to drain. Give the chopped tomatoes a stir every now and then to help them drain. For the peppers - you can use any colour bell pepper you like, and as many jalapenos as you like (or hotter peppers like habanero if you prefer), but you need to keep the total amount of chopped peppers in the recipe at 1 3/4 cups. Don’t increase this amount as that will change the acidity of the salsa. I usually use 5 smaller jalapenos, two with the seeds left in, and then fill the remaining pepper quota with chopped green pepper (it’s usually 1 to 1 1/2 cups, depending on how big the jalapenos were). You can increase or change the amount of dry seasonings in the salsa, but don’t increase the fresh cilantro. Make sure to use the full 1 cup of vinegar as this is necessary for the acidity to be correct for canning. You can replace some or all of the apple cider vinegar with bottled lemon or lime juice if you prefer. You can make this salsa in half pint (250mL) jars instead if you like, but don't use bigger, quart (litre) sized jars as this recipe hasn't been tested with those and it may not be safe to can in them. This recipe can be doubled (if you have a large enough pot!) or halved. Source: Slightly adapted from GardenWeb .